Weather experts say the next couple of weeks could be some of the worst in state history for wildfires caused by lightning strikes. Three years of drought have caused the state to become incredibly dry, with significantly more wildfires than last year. "From here on in as we finish July and go into August, it's just going to get considerably worse," said Basil Newmerzhycky, a fire weather meteorologist at the Northern California Geographic Area Coordination Center, a wildfire-fighting center in Redding. Newmerzhycky says over the coming weeks we could see 500-1,000 lightning strikes across the state. 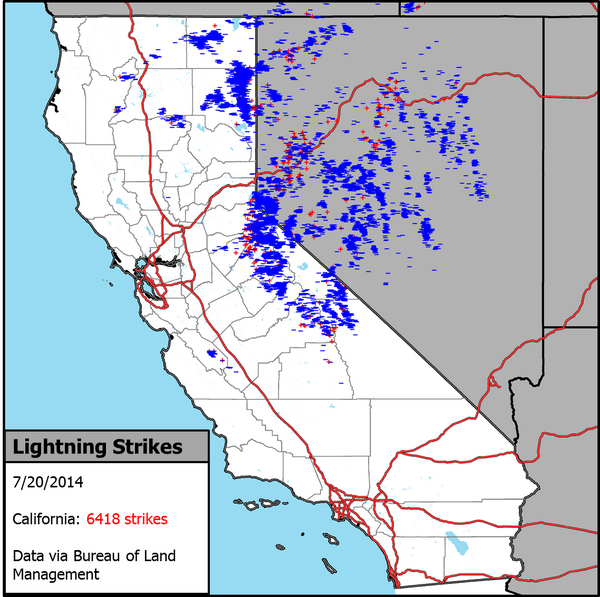 (Update: In fact, check out the graphic below from the National Weather Service; there were 6,000 lightning strikes detected in California just yesterday.) Last week, thunderstorms in the Sierra brought plenty of lightning, and a few fires started in Yosemite. According to the Fresno Bee, those were extinguished, and since the lightning was accompanied by rain, it didn't do as much damage as it would have had it been dry. Nonetheless, Newmerzhycky expects that wet patch to be short, with a return to dry conditions and a high risk of fire later this week. "With a normal lightning pattern, we will probably see an above-normal fire occurrence," he said, chalking it up to the extremely dry vegetation. "If we happen to not get as many lightning events, though, that could be our saving grace." 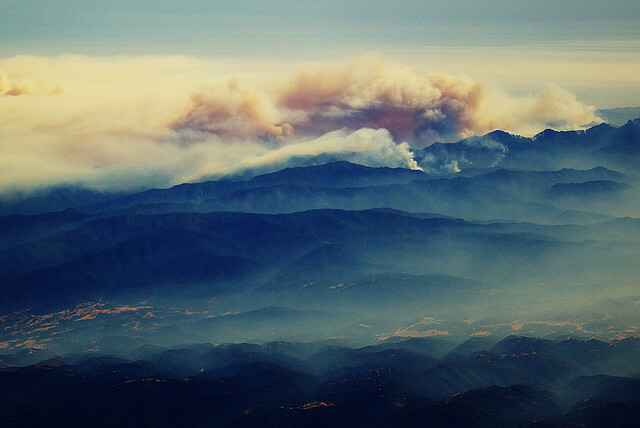 In 2008, dry lightning ignited more than 2,000 fires in California in a span of a few days.